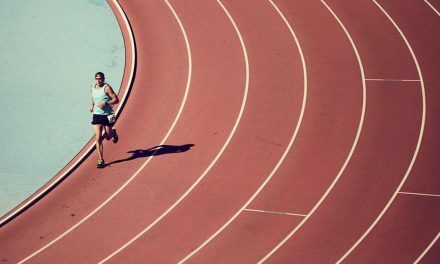 The Sri Chinmoy ‘24 Hours on Track’, featuring a 24hr, 12hr, 6hr and marathon race, was held on Saturday and Sunday (June 2-3) at the Campbelltown Athletics Centre near Sydney. It was an amazing turnout across the weekend, with 38 entrants taking on the 24hr, 17 in the 12hr, 15 in the 6hr, and 16 in the marathon. AURA members represented the 12hr and 12hr divisions superbly and took podium standings with exceptional results! 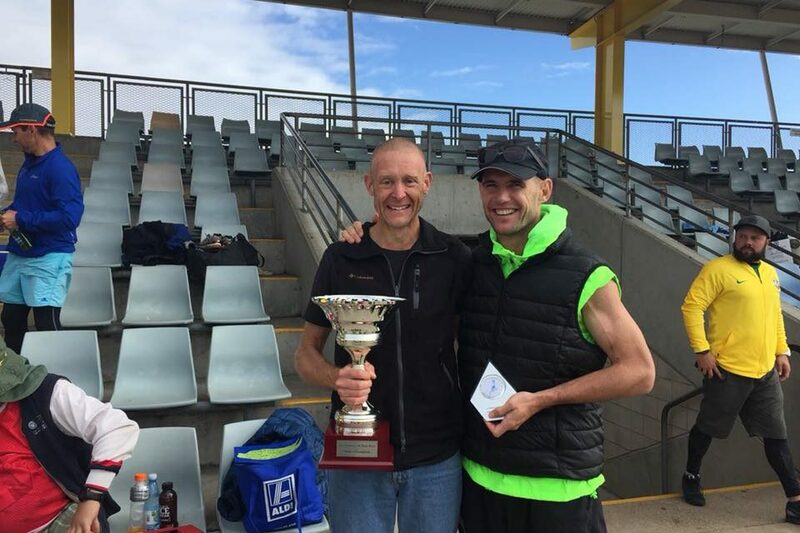 In the 24hr event, AURA’s very own Stephen Redfern from Heathcote, NSW claimed overall 1st place with a total 613 laps on the certified 400m floodlit track, completing 245.566kms. Queenslander Matthew Eckford wasn’t far behind him, after successfully running 605 laps to finish with a distance of 242.201kms and claiming 2nd overall. AURA members savoured all three podium finishes for the men, with John Yoon from Kensington, Vic taking the bronze standing following 569 laps and a total distance of 227.610kms. Redfern’s sentiment post-race on social media confirmed what a great event the Sri Chinmoy always is. “I went in quietly hoping to be able to get a distance to get me an ‘A Qualifier’ of 240kms to put in an application when they open in December for the World 24hr Championships next year,” he said. “I was able to do that, and all whilst getting a massive 25kms PB on my previous best distance, also at this event last year. “Special mention to Matthew Eckford, who put in a stellar performance to also track 242kms and also qualify as well; I loved being able to chase him for the entire race over the whole 24hrs. For the women, two out of three of the placings belonged to AURA members. Sharon Scholz from Wangaratta (Vic) successfully completed 471 laps to cross the finish line first for the women with 188.450kms, while Murrumbeena’s Cheryl Symons claimed third in the ladies’ standings following 443 laps and 177.350kms. 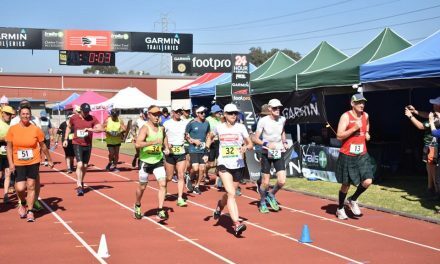 A big congratulations to our AURA members who landed podium finishings, as well as those who rocked the 24hr event and gave it their all out on the track, including Sabina Hamaty (164.294kms), Justin Scholz (161.200kms), Karen Chan (160.906kms), Tony Wilms (120.321kms), Karen Barrett (119.600kms), Rod Rainey (100.000kms), Annabel Hepworth (76.400kms), and Gary Mullins (35.600kms). In the 12hr event, we had five amazing runners tackle the distance and get great figures at the end. 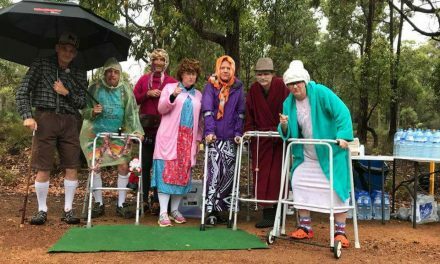 Well done to Brad Boyle (85.772kms), Gemma Worland (63.960kms), Cathie Wiltshire (55.186kms), John Nuttall (52.667kms) and Tova Gallagher (45.202kms). The next events on the AURA-listed calendar are the Gold Coast 100k, Cleland 50k, and the LeFevre Coastal all on Sunday, June 10. Following those three races will be Wild Goose Chase, in WA across the weekend of June 29-July 1. There is still time to register for each and every one of these events, just click on the links! *As of Monday, June 4 all results from Sri Chinmoy are provisional until revised and approved later in the week. Pictured: Stephen Redfern at the end of Sri Chinmoy. Photograph – Supplied/Facebook.